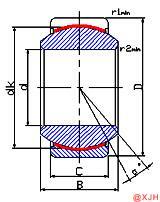 Spherical Plain Bearing GEG.ET 2RS Series is a bearing that works under sliding friction. The part of the shaft that is supported by the bearing is called the journal, and the part that matches the journal is called the bearing. The layer of friction reducing material cast on its inner surface in order to improve the frictional properties of the surface of the bearing pad is referred to as a bearing lining. Spherical Plain Bearing GEG.ET 2RS Series is a bearing that works under sliding friction. The part of the shaft that is supported by the bearing is called the journal, and the part that matches the journal is called the bearing. The layer of friction reducing material cast on its inner surface in order to improve the frictional properties of the surface of the bearing pad is referred to as a bearing lining. The material of the bearing bush and bearing bushing is collectively referred to as a plain bearing material. Spherical Plain Bearing GEG.ET 2RS Series applications are typically used under high speed, heavy duty, high precision or intermittent operating conditions. Spherical Plain Bearing GEG.ET 2RS Series works smoothly, reliably and without noise. Under liquid lubrication conditions, the sliding surface is separated by the lubricating oil without direct contact, and the friction loss and surface wear can be greatly reduced, and the oil film also has a certain vibration absorbing capability. However, the starting friction resistance is large.